For my first review for Meefers.com, I attended the 30th Anniversary of the Liberace Museum and Scholarship Foundation on Wednesday (April 15th). It was a really great night. They had a red carpet reception followed by a two-hour benefit attended by a bunch of stars from the Strip. If you have the opportunity to get to the museum, you should definitely do so. Liberace's outrageous outfits, cars, and custom pianos are all on exhibit and the museum offers guided tours. 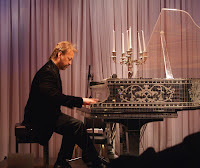 Also, Philip Fortenberry, the "Jersey Boys" pianist, performs daily in the Liberace Cabaret Showroom. The show, which is entitled "Liberace and Me," pays homage to the spirit and legacy of Liberace's music and its impact on Fortenberry. Thanks for following my blog. It´s my honor to show my gratitude by show your blog link under Pay It Forward (links) on the right side of my website.